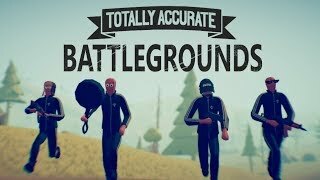 Developed by Landfall, Totally Accurate Battlegrounds (or TABG) is a parody-based battle royale game video game, available for the Windows operating system. 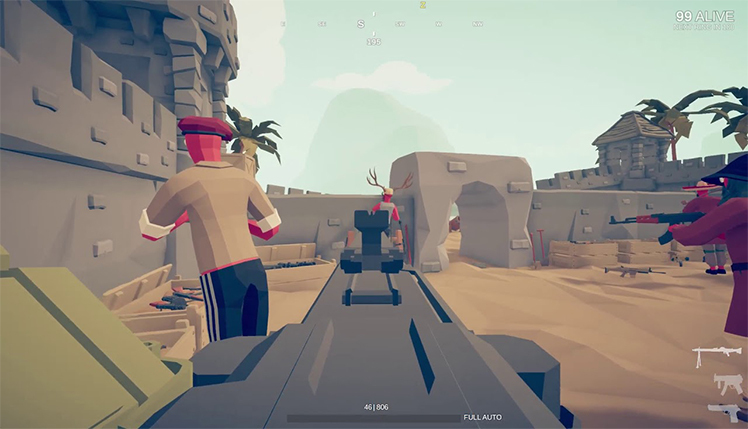 TABG is the latest in Landfall's line of goofy battle simulation games. A loving parody of the battle royale video game genre, it takes place in a closed arena with borders that continuously close in. Up to 50 players duke it out against each other until only one person or team is left standing. 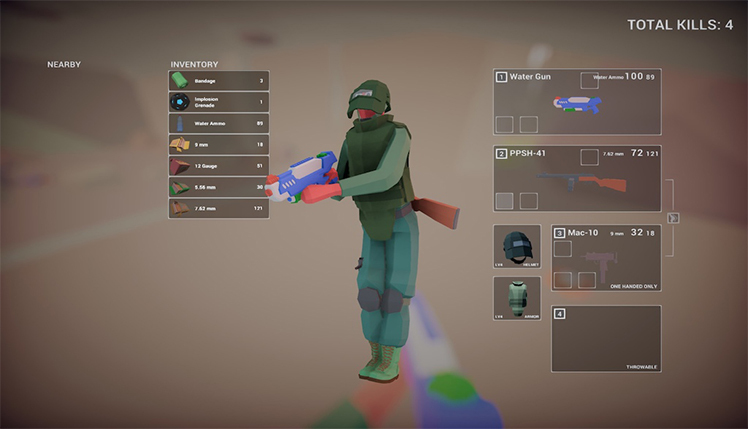 It is a parody of various popular battle royale games and their mechanics. 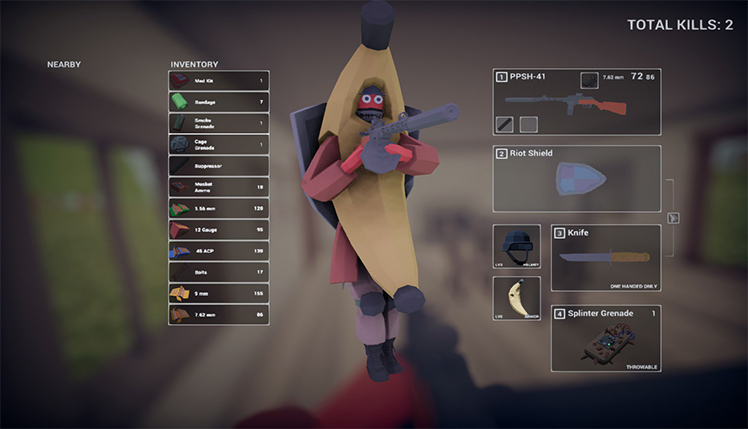 TABG is spoofing titles like PlayerUnknown's Battlegrounds and FortNite. It combines the goofy physics and dummy combat of the other Totally Accurate Battle games with an impressive version of closed arena combat. TABG is far more than either its premise or the sum of its parts would seem at first glance. 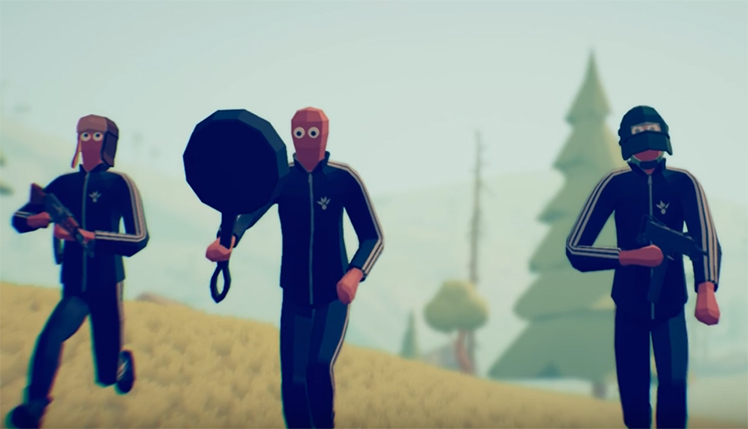 TABG takes the elements common to the battle royale genre and gives them a goofy spin. For example, players are dropped into the map from the sky at random points, deciding what time to drop and which direction to fall. Instead of a plane, TABG sends players into battle on top of a flying train. The train launches players like a cannon, having them harmlessly crash into the ground far away to land. 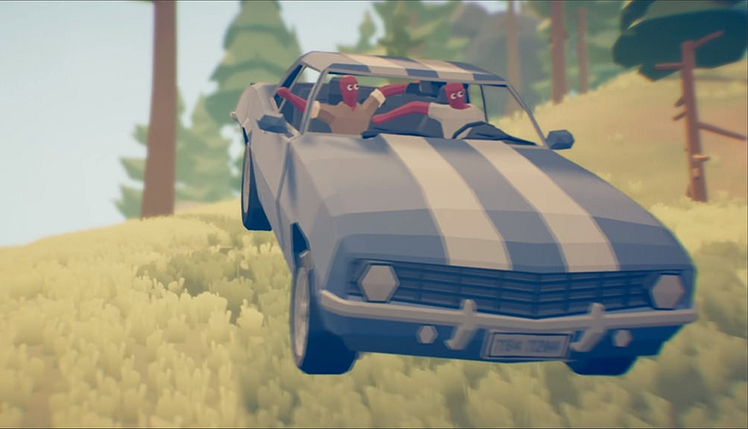 This is but one way TABG sets itself apart by subverting expectations within the battle royale genre. Serious body armor is side by side with funny alternatives like the incredibly durable pickle costume. Cars and motorcycles are vehicles that travel at the same speed as the bicycle. Melee combat without weapons isn't a serious fist fight, but two players flailing about and slapping one another. Perhaps the most interesting part of TABG is its detailed environment. While everything has a soft all-ages feel, a large amount of care went into realizing the battlefield. 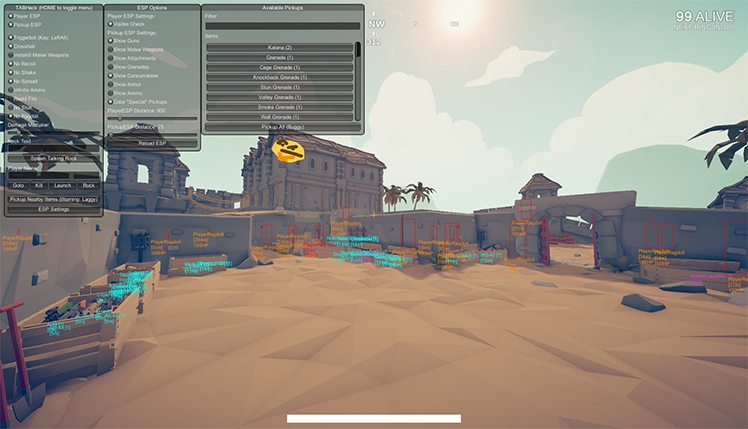 Varied environments like decrepit castles, riverside villages, and barren houses come together to serve as spaces for combat. The barrier surrounding the active play area takes the form of pillars instead of traditional forcefields or walls of gas. These pillars form a wall which slowly moves through the sky before crashing down when the arena becomes smaller. When the wall can get no smaller, the water in the play area begins rising as lava. While the video game does have bugs, the bugs usually serve to increase the hilarity in each match. These bugs are sure to anger those who take the game too seriously. Even so, characters clipping through objects or limbs flying everywhere is simply too funny to worry about patching out. 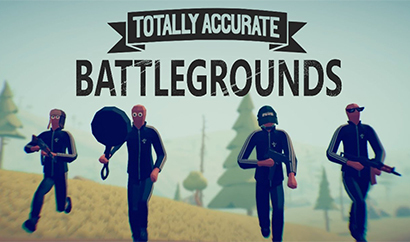 Totally Accurate Battlegrounds is one of Landfalls yearly April Fools creations to keep fans occupied for the upcoming release of Totally Accurate Battle Simulator. It combines humor and solid gameplay elements into an action-packed thrill. 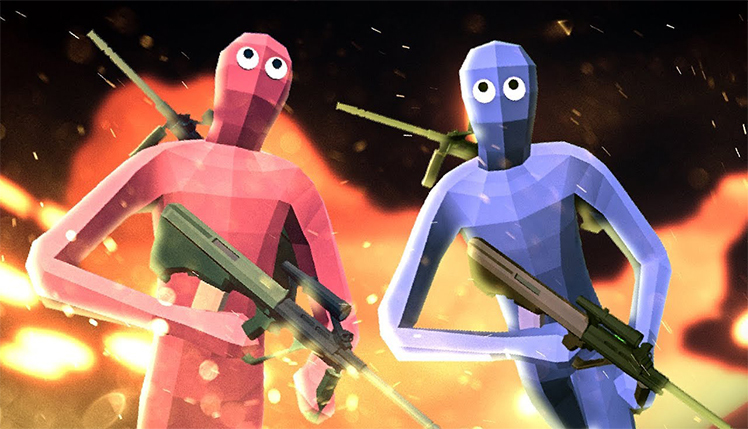 There's plenty to explore in Totally Accurate Battlegrounds and is perfect for all the weirdo gamers out there. 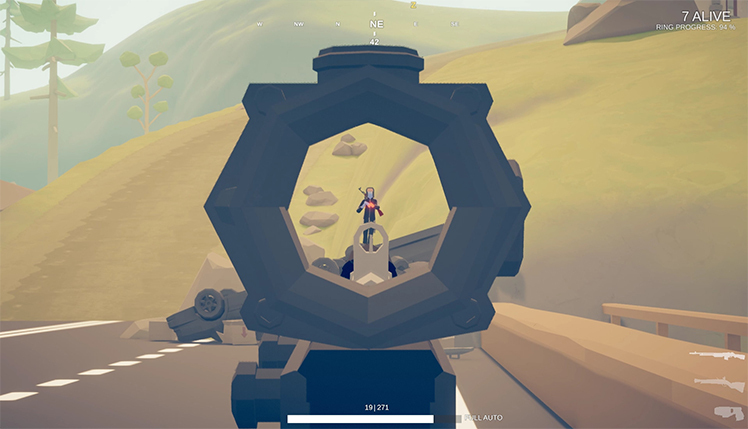 Totally Accurate Battlegrounds is a goofy physics-based battle royal game that takes strategy and a lot of wits. Destroy your opponents from every angle. © 2018, Landfall. Landfall logo, Totally Accurate Battlegrounds, the Totally Accurate Battlegrounds logo, are trademarks or registered trademarks of Landfall. in the United States of America and elsewhere. All rights reserved.